Robles is still in a competition with Michael A. Taylor for the Nationals' starting center field job, Jesse Dougherty of The Washington Post reports. 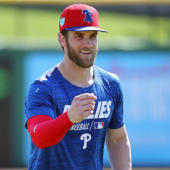 Following the news Thursday that Bryce Harper was officially joining the Phillies, Nats manager Dave Martinez reiterated that Robles and Taylor were still fighting for the position, although Martinez also indicated that both would see significant playing time this season. The club would certainly prefer it if the 21-year-old Robles emerged with the starting job, and while his 1-for-8 start to the spring may not look encouraging, his 3:3 BB:K and two steals in two attempts highlights the youngster's fantasy potential.